I’ve always said that being a food blogger allows me to be an urban explorer from a taste perspective and this has never proved to be true as much as it did on my most recent visit to Amman. 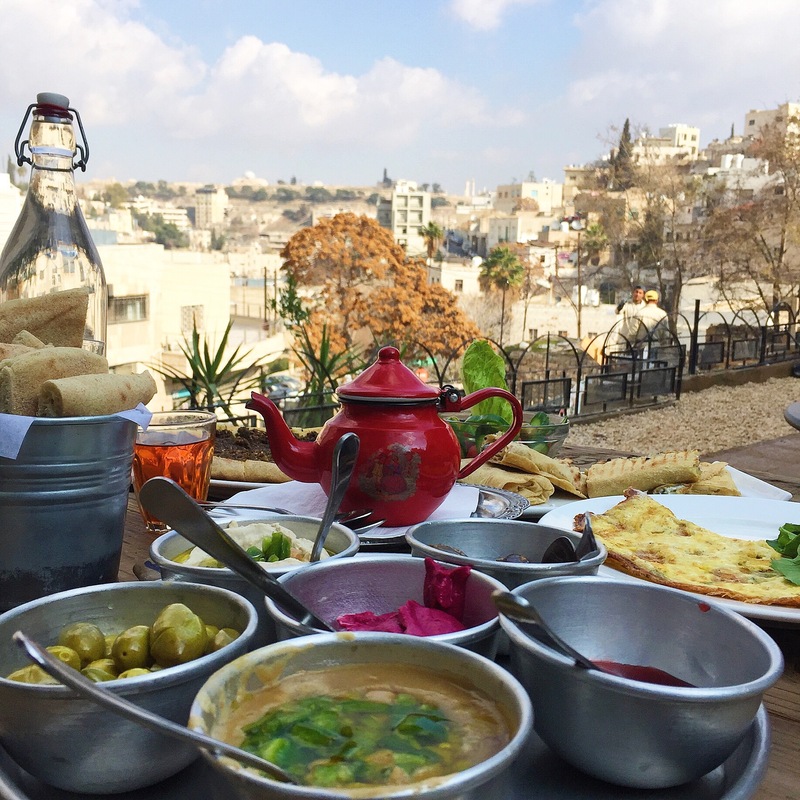 Being Jordanian myself I am familiar with the culinary landscape of the city but a recent self-curated food tour allowed me to see Amman through a new lens. In hopes of rediscovering the county’s charm, I veered off the beaten path and away from popular stakeouts Hashem, Shawarma Reem, Habibah and Falafel Quds. Alternatively I carefully mapped out a food trail to take me through a neighborhood at the epicenter of Jordan’s burgeoning arts scene, Jabal Al Weibdeh, and this is what I found. 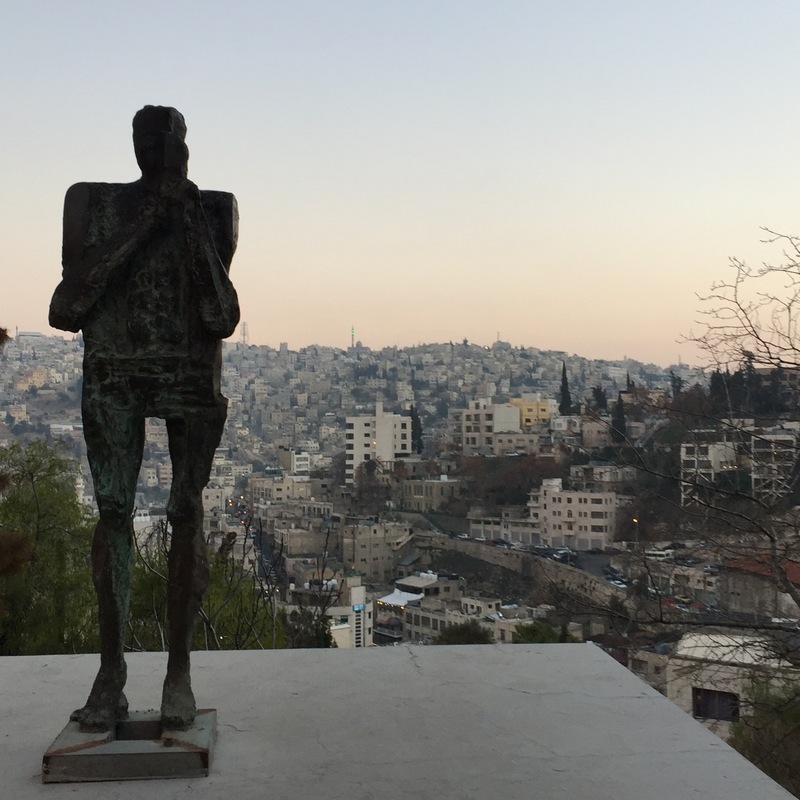 The noble neighborhood sits atop one of Amman’s notorious seven hills in West Amman, the new city, just on the cusp of East Amman, the old city, overlooking many historic sites. The location is as appropriate as the metaphor it represents, a place where old and new worlds collide. Currently undergoing somewhat of a regentrification, Jabal Al Weibdeh escaped the modernization surrounding it leaving the original facade untarnished. Rich with cultural integrity, the area is littered with the likes of backgammon boards, mosaic tiles and ancient ruins and is overrun with both locals and expats. It is a place where old villa’s are converted into art galleries nestled amongst clementine trees, a place that swaps franchise restaurants for homegrown concepts, essentially a place doing its best to stay true to its roots. 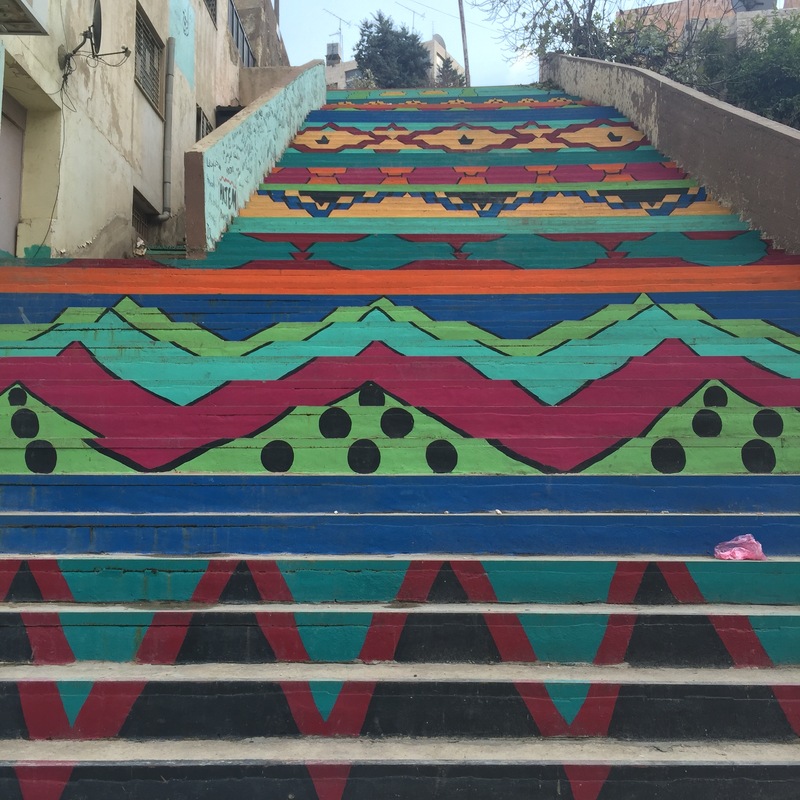 Before scaling Jabal Weibdeh, make your first stop at Shams Al Balad, which you’ll find as you descend Jabal Amman. The rustic space is known for its classic Jordanian breakfast and is among the city’s first outlets to embrace the farm-to-table concept. Explore the charming interiors before heading up to the terrace overlooking Amman’s Citadel in the distance. Go heavy handed on the creamy and vibrant purple beetroot mutabbal, makdous and grilled cheese wrap laced with thyme and mint. Once you’ve had your fill, follow the winding road from there down the hill to downtown Amman where you’ll find bustling souks and eateries. 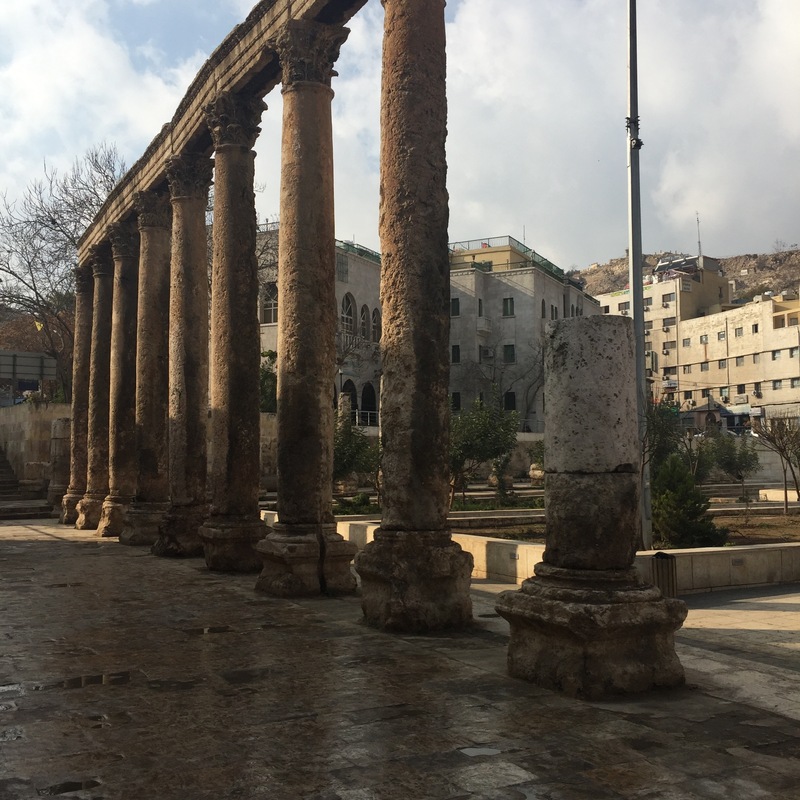 Make your way down the main road to the Roman Amphitheater, the second century monument is a remarkable reminder of the history that runs through the veins of the humble monarchy, meander through the ruins for a photo op before grabbing a cab up the hill to Jabal Al Weibdeh. Once you’ve reached Kulliyat Al Sharee’ah Street, stop for caffeine at Rumi Cafe, a tiny tea room overrun with Ammani hipsters. 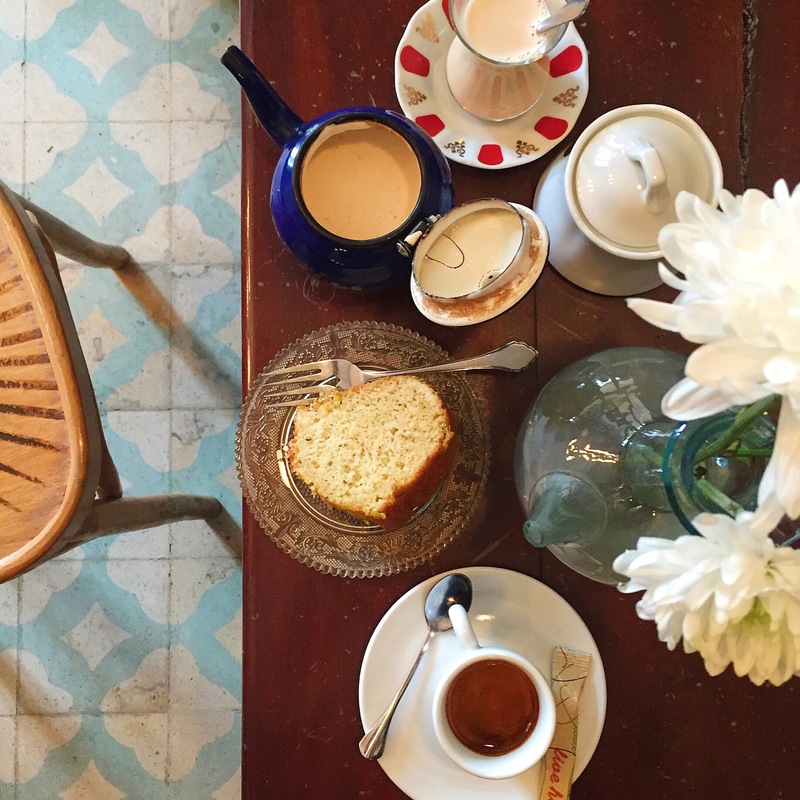 The dimly lit space is narrow and enchanting, one pot of Rumi’s Yemani tea and a slice of delicate Cardamom Cake appropriately served in antiques are almost as poetic as the Persian poet himself. If you are in search of more classic desserts step into Patisserie Fayrouz just across the street, the neighborhood bakery of choice for several decades, for mille feuille and eclairs. On Friday’s, nearby cafe Fann wa Chai, or ‘Art and Tea’ put on a small farmer’s market, a great opportunity to mingle with locals and pick up some organic produce for your stay. In an effort to digest, walk two blocks over to Al Baouneyya Street for a stroll through Jasmine House, appropriately set against a sea of jasmine flowers, for a glimpse of the latest local art the communal creative space has to offer. For lunch trek back up the hill to Oliva, a pizzeria and a brief departure from traditional Arabic cuisine. 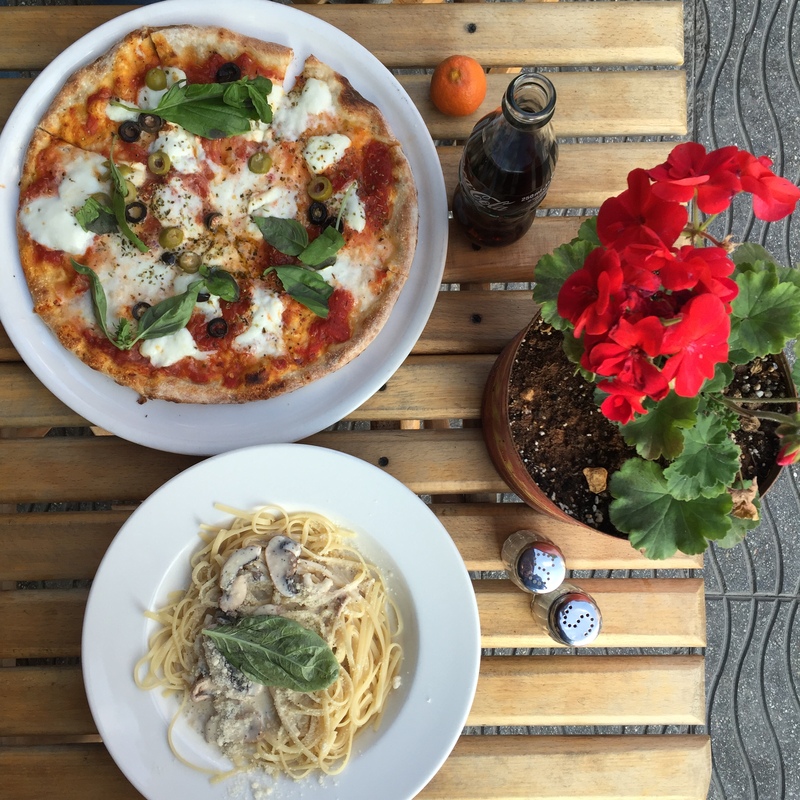 Their wood-fire oven produces some of the best pies in Amman, pair a slice with a bite of their indulgent Linguini Alfredo but do save space for the next stop just two blocks over. Garo’s, a dive Armenian sandwich shop, is indicative of the significant affect Armenian food has had on Jordan. Often my first stop on my way home from the airport, the casual restaurant is home to arguably the best Soujuk and Qawerma sandwiches the country has to offer and are served up by the chatty Garo himself, who embodies the hospitality that Jordan is so famous for. From there, walk to Paris Circle and then downhill toward Luzmilla Hopital, follow the winding road down and to Nadim al Mallah Street where you will find Darat Al Funun, or ‘the house of art’. Home to some of the Levant’s most talented artists, Darat Al Funun spills over the hillside overlooking the old city, a short walk around the property reveals a stacked garden of sculptures with sixth-century Byzantine Church ruins at the bottom, an archeologists playground. The space guards an extensive art library and multiple rooms adorned with contemporary paintings, photographs and mix-medium canvases all wrapped up in several restored 1920’s villa’s. Art lovers can continue the tour one block down the hill to Dar Al-Anda for an impressive spread of fine art and colorful architecture. For the ambitious, do book a cooking class across the street at Beit Sitti, a quaint concept which allows guests to cook their own Levant-inspired meal. Beit Sitti, meaning ‘my grandmothers house’, is for those who are serious about sinking their teeth into local delicacies like musakhan, a sumac-spiced chicken and caramelized onion flatbread and knafeh, a cheese pastry doused in syrup. If you are looking for a night cap, grab a glass of the local wine at Cafe De Paris up the street at Paris Circle to rub elbows with the locals. The sites in Jordan are undeniable, don’t miss sunrise in Wadi Rum, hiking through Wadi Mujib and the buoyant Dead Sea, but a few days in the capital is not to be missed for a another perspective on Jordan’s history, culture and food. I’ll leave you with a few tips for your visit to Amman, the city isn’t built for pedestrians so be ready to bargain with cabbies, English is widely spoken but learning a few Arabic words will benefit you, embrace the copious amounts of garlic and expect to be lovingly force fed – it’s an essential part of Jordanian hospitality.